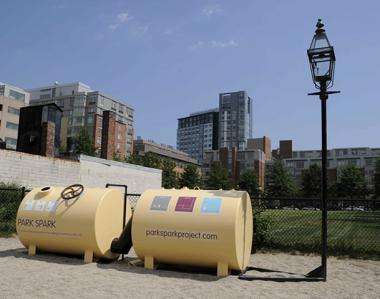 (PhysOrg.com) -- A methane digester called "Park Spark" has been installed in a dog park in Cambridge, Massachusetts. The device produces methane by bacterial digestion of the dog excrement, and the methane is used to light a gas-burning street lamp. People walking their dogs are encouraged to collect the feces, place them into the supplied biodegradable doggie bags and drop them into the digester feeding tube. They then turn a hand crank to stir the mixture of excrement and anaerobic bacteria in the Spark Park digester and help the methane rise to the top where it is burned constantly in the lamp, like an “eternal flame”. The bacteria are confined to an underground container and the methane is piped underground to the lamp. Methane is the colorless and odorless gas that forms the major component of “natural gas” used for cooking and heating. 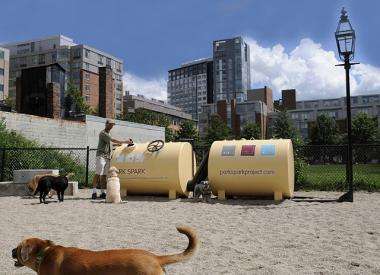 The idea was the brainchild of Matthew Mazzotta, a conceptual artist, and the project was partly funded by the Council of the Arts at Massachusetts Institute of Technology. 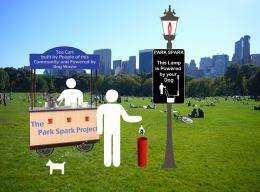 The team hopes there will be enough methane generated to power other objects in the park and surrounding community, such as shadow projection boxes, tea carts, or popcorn stands, but the main aim is to demonstrate to the community that waste is a precious resource. “As long as people are walking dogs and throwing away dog poo, a flame can burn,” they say on their website. The eternal flame of the lamp is intended as a reminder of the “redundant and unquestioned” nature of our behavior, and will burn until someone comes up with a better idea for using the energy available. Methane digesters are used in many places around the world for cooking, heating and lighting. They can use almost any organic materials, and large scale digesters often use materials such as cow manure. The results of methane combustion are CO2 and water, and while CO2 is a greenhouse gas, methane is over 20 times more potent. What I'd like to see are more detailed instructions on how to build one! One wonders just how economical this device actually is, once you figure in the costs of acquisition and maintenance. Or maybe it's constructed to appeal to the hybrid-driver set, who apparently don't have a problem with only recouping their investment after five times the service life of the vehicle. "Methane is the colorless and odorless gas that forms the major component of “natural gas” used for cooking and heating." sure. Any volunteers to confirm this statement for the doggy poop gas ? But how much energy are you putting into the system by cranking the handle and mixing the contents? This definitely decreases the net power you extract from the dog based fuel. You'd probably do well to install tennis balls tethered to piezoelectric bands. Just let the little critters tug and pull till their hearts content. I always said my dog was the light of my life. Are you an idiot, TJ alberta? What's to doubt about that? It's common knowledge. The basis of natural gas is methane... It's not that wild of a concept. Chill with ad homimem aroc91. Methinks TJ_alberta's just sayin he might not want to cook with it. It's amazing to me that this article would be posted here. What it's full of sure ain't physics! I do like this idea - although it might be worth investigating how this could be used on farms where there is a lot more faeces to collect. @anonperson: I would also like to build one!